Digital Radio taking over the AM band? The mediumwave (AM) band in the United States is gradually turning digital. 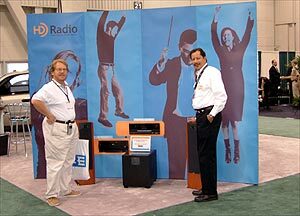 In October 2002 iBiquity's digital IBOC technology was approved for AM and FM broadcasting in the United States. Currently 19 U.S. AM stations are listed using IBOC technology to broadcast simultaneously in both the analog and digital modes - however, only half a dozen stations have been observed experimenting with IBOC. IBOC stands for in-band on-channel technology, which enables digital broadcasting in the AM and FM bands while analog signals continue to be transmitted at the same time. The present IBOC system is referred to as a hybrid, because it is neither totally analog nor fully digital. During hybrid operation, existing receivers still continue to receive the analog signal. New digital receivers being developed are expected to incorporate both modes of reception, where receiver will automatically switch to the analog signal if the digital signal cannot be decoded or is lost by the receiver. Enhanced sound quality and the potential for new wireless data services are the most important improvements cited by proponents of the IBOC technology. IBOC digital radio is expected to provide near CD quality reception for stations operating in the FM broadcast band. For AM stations, IBOC digital radio is expected to provide reception approximately equal to today's analog FM reception. Officially, minimal impact is anticipated on reception of existing service. DXers however are worried that digital broadcasting will gradually ruin AM DXing - or at least the way AM DXing has been practised for decades. About 130 stations have been licensed by iBiquity to use the technology. As of March 20, 2003, stations haven't needed a permission from the Federal Communications Commission (FCC), they only need to inform the FCC within 10 days of having begun experimenting with IBOC. DXing.info also had a Q&A session with Laura Taylor, public relations official at iBiquity, to find out more about the current status of IBOC broadcasting. Here's what the developer of the new technology has to say. Is there any difference between AM and FM stations as to what extent IBOC has been adopted? - HD Radio technology is being adopted in small, mid-size and large markets across the US. Stations in these markets that are licensing are primarily FM, but we also have strong support from AM stations. I believe right now the numbers break down into 70% FM and 30% AM. Can you provide a list of the AM stations that will shortly begin using IBOC? - The process of licensing from iBiquity is at the very beginning of a larger process for turning the station on the air. Factors contributing to going live include FCC licensing through equipment ordering. Therefore, iBiquity does not track when stations go on live with an HD Radio system. What are your first impressions of these test broadcasts? - We have had very positive feedback from the broadcast community and the FCC. With full confidence in the viability of our product, the FCC approve our IBOC-based HD Radio technology for use as the standard for delivering digital in the US. We expect that the upgraded sound quality and services will be a great benefit to the broadcasters as we move forward with rolling out this technology and as it reaches the consumer marketplace. What is the status with consumer receivers - how widely are they available and what is the consumer price? - Kenwood has HD Radio Ready product on the shelf right now, with a black box solution to ship in the summer of this year. By winter 2003, we expect product widely available on the retail shelves. Other partners committed to product this year are Harman Kardon and Yamaha. To check on specific dates, I would defer to the manufacturers to give you the answer. - HD Radio technology is one of the most thoroughly tested broadcast technologies ever developed. We have gone through extensive testing over a four year time frame and have turned those results over to 3rd parties and the US govt (FCC) for review. The FCC has determined that our technology is acceptable for use and does not significantly impact adjacent stations through interference.